No, we don’t have some idiot out there using the OpenInsight Console, only well informed, intelligent and upstanding people – I digress. As the Revelation 2013 Conference attendees head off to the second set of breakout sessions of this year’s event, they will be making their way to sessions presented by Bob Catalano and David Goddard. 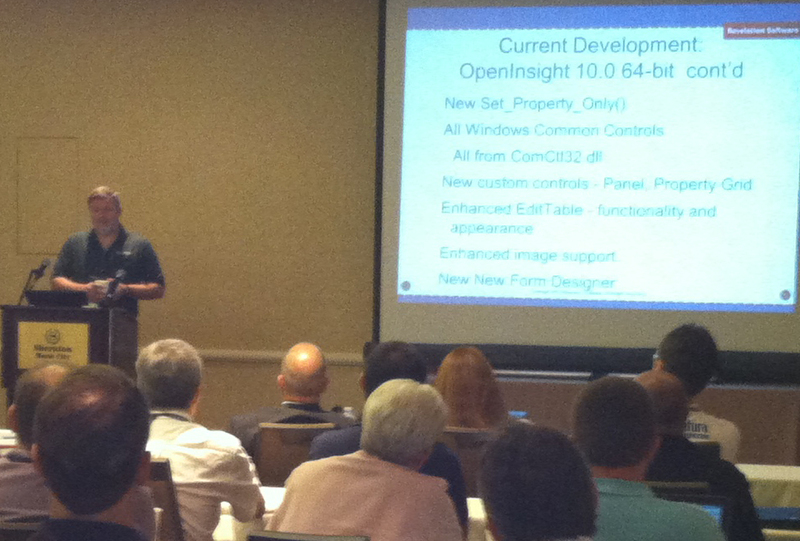 OpenInsight version 10 is scheduled to include a new OI Console and during this presentation Bob will provide his audience with an overview of what developers can expect to receive in the new version. The OI Console is a browser-based Database Management utility with numerous features that include: Database Statistical Dashboards, Indexing, User Management Tools, Table Re-Sizing Tools, Lock Management, Base filing System Management and Configuration Record Maintenance. With a list of customer requested features that long, this will be a session that will appeal to anyone who is responsible for, or who administers a Revelation based system. Despite the title of this session and this blog posting, Revelation really do love and appreciate their developers and users. However, Git is a free and Open Source distributed version control system that is designed to handle everything from small to very large projects with speed and efficiency. Git was built to work on the Linux kernel, meaning that it has had to effectively handle large repositories from day one. Speed and performance has been a primary goal of the Git from the start. One of the nicest features of any Distributed SCM, Git included, is that it is distributed. This means that each developer has a full copy of the repository locally on their laptop/pc. this frees the developer to work remotely from a central server and still have full access to the source management repository. Changes can easily be pushed/pulled to/from a central server or directly to another developer. David’s presentation will demonstrate how Git can be used with OpenInsight. With some sneaky repository hooks, 90% of the work is done for you, automatically, in the background, while you get on with creating great OpenInsight based software. It really can’t get any easier than that. But wait, there’s more…. if attendees like what they see, they can try the OpenInsight Git interface free in a copy of OpenInsight straight after the presentation. I am assured that developers will wonder how they ever worked without (a) Git by their side. OK, so we all know that OpenInsight has high availability inherently built in but it is interesting to bring the two initial session titles together in such a way. With the opening addresses now done and dusted, the conference is getting down to the technical side of the proceedings and one of the main and many reasons why OpenInsight developers from all over the world have taken the time to be in Nashville this week. Carl Pates (Sprezzatura) and Jared Bratu (Revelation) go head to head in this first breakout session. Carl will be talking about Revelation X (OpenInsight 10) and Jared will be taking on the topic of High Availability, Network Design for O4W websites. Those of you following the “Building OpenInsight 10” blog will know that the next generation of OpenInsight is well on its way. During this first public presentation about this new and exciting version of our toolset, Carl will be demonstrating some of the new features and enhancements to the Presentation Server. Those people attending his talk will finally get to see that the enhancements shown on the blog are really REAL and not faked as vapourware in Photoshop! During his talk Carl will touch on topics that will include: The New Graphics Engine, New Controls, New Tools, What’s changed (and why) and what is yet to come. Attendees to Carl’s talk will be encouraged to offer suggestions for further enhancements for features that they would like to see in the toolset from version 10 onwards. Going up against Carl and such an exciting presentation as his on version 10 will be no mean feat. However, with more and more O4W based solutions going live and into the cloud, web, internet (whatever you wish to call it today), this is sure to be another popular breakout session with the attendees. Taking on the form of a tutorial, Jared will educate his audience on the implementation of a high availability website cluster and frontend proxy server for O4W websites. Attendees will learn how to identify key items of the cluster configuration for integration with an existing site. Jaren will talk about the advantages and disadvantages of moving the OEngine server service off of the database server and scaling it onto multiple webservers. Attendees will leave this session with valuable PowerShell scripts that will enable attendees to deploy configurations across multiple servers. Regardless of whether you need to scale your website or you just want to understand some options that are available for the future, attendees will find out how an Open Source front-end proxy server can add capacity without making any code changes. Attendees will also gain knowledge of Open Source tools that are available to help to test a site’s capacity and then to benchmark any changes made to the site. If you have ever wondered how many users your site can support (a question that I am asked during just about every pre-sales O4W discussion), how it can scale to support more visitors, or you are looking for improved site reliability, then you will definitely benefit from this session and walk away with knowledge that is certain to get you started on the right path. With a schedule like that, I can see many delegates hovering outside both doors pondering which session is the must see. For me, well I’d sit in on one with a stethoscope to the wall listening to the other – they are both just too good to miss. 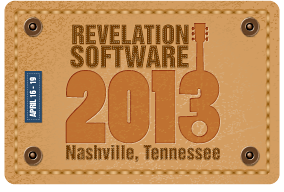 This morning the Revelation Software 2013 conference gets underway properly. Following the welcome reception yesterday evening and breakfast an hour ago all of the Revelation staff and conference delegates will gather together to listen to Mike Ruane’s Welcome Address. He’ll no doubt talk about what has happened at Revelation since the last conference, the state of the company and the product line as of now, our plans for the foreseeable future and set the scene for the next few days at RevCon2013. At 09.30 (local time in Nashville, TN), Billy Kirsh will take to the stand for the keynote address entitled Harnessing Your Creative Power. As an award winning songwriter, Billy Kirsch has harnessed the power of creativity to lead a successful life as an entertainer, songwriter and entrepreneur. His work includes award winning songs and career songs for many artists. “Holes in the Floor of Heaven” recorded by Steve Wariner, won a CMA song of the year award, was nominated for a Grammy and was a number one hit. Top 10 songs, “Is It Over Yet” and “Come Some Rainy Day”, both recorded by Wynonna Judd, have become standards in the repertoire. “Stay Gone” launched singer Jimmy Wayne’s career as a Top 5 single. The list of artists who have recorded Billy’s songs include Tim McGraw, Kenny Rogers, Lee Greenwood, Alabama, Collin Raye and Steve Wariner to name just a few. Billy’s appearances and concerts have been televised: including The View, Regis and Kathie Lee and Live from the Bluebird Café. Billy’s unique abilities as facilitator, leader and performer are the foundation of his highly successful corporate event programs, Team Building Through Song and Harnessing Your Creative Power. Following the keynote address, Mike will again take the stand to introduce the Revelation staff and then take an hour running through What’s New with Revelation and OpenInsight. The 2013 Revelation Conference is now well and truly open for business. This year, after considering many sites across America, Revelation narrowed the shortlist to Nashville and Orlando and after putting it a customer vote, Nashville won outright. So, the team and a good number of Revelations developers and users have headed over to the Sheraton Music City Hotel in Nashville for a few days of education, fun and culture. Nashville has much to offer the delegates during the conference down time. The cities clean streets and comfortable weather at this time of year are ideal for sightseeing and there is plenty of that for everyone. The clear attractions are the beautiful museums and live music at every turn, including a stage at the airport! If the music is not for you, then Nashville has its own zoo, galleries and shopping is abundant and diverse. However, for me, the main attraction to RevCon is the talent that makes up this premier Revelation event. Yet again, Nancy and the team have put together a stunning schedule that will see many of Revelations best talent presenting on a myriad of OpenInsight related topics. As always, this is sure to be yet another conference where learning and networking will be high on people’s highlight list. So, this evening sees the Welcome Reception where Revelation staff will be welcoming the conference attendees, giving out the conference packs and sharing in some sophisticated discussion, and maybe more than a little gossip and small talk. The reception will run from 7.00pm to 9pm Nashville time. Tomorrow, breakfast will be served from 8.00am with Mike giving the welcome address at 09.00am. For conference attendees and those of you who are interested, I hope to provide a running commentary of the sessions as they come up. I’ll be posting post postings so that those of you who subscribe will receive your usual notification through your usual chosen method. However, if you don’t want to keep up with events over the next couple of days, please simply delete any notification from me that begins #RevCon13. Hopefully, this will help to minimise any inconvenience whilst leaving your notifications in place for future postings.